Today, we're very pleased to announce a new FrontlineSMS release - version 1.6.16, to be precise - with two major new features: MMS receiving and the Reminders module! With this release, FrontlineSMS allows you to receive multimedia messages via a standard email account. More complex than SMS messages, MMS can include text, images, video and audio. This is a massive step forward for FrontlineSMS, and opens the door for the first time to receiving photo, audio and video reports, medical diagnostics via MMS…and more user innovations. We hope you will share your ideas, and if you plan to use MMS with FrontlineSMS please let us know! For the moment, FrontlineSMS can only receive MMS via email, which requires the computer running the platform to have access to the internet. However, most mobile carriers worldwide support sending MMS from a mobile phone to an email address. Read more on our updated help pages. Another keenly awaited new feature is the Reminders plugin from Dale Zak, which allows you to schedule email and SMS reminders for a specific date range and interval such as hourly, daily, weekly, monthly or by specific day(s) of the week. Examples of practical applications include prompting patients to take anti-retroviral medication, reminding parolees to meet with probation officers, and helping special needs populations to live independently. Already, Babakan Sari Community Health Center in Indonesia has expressed enthusiasm for using the new feature for outreach to Tuberculosis patients. Many of you are familiar with Dale - he is an active social mobile developer who also works as Mobile Project Manager for Ushahidi. The reminders plugin source code has been available on GitHub for some time for those of you with the developer skills to incorporate it into FrontlineSMS. Now we are delighted to bundle it with this official release. It's still in Beta, which means we want our users to actively test it. Please let us know if you encounter bugs and (as ever) we welcome your feedback and comments on how we can make improvements. We think the Reminders plugin illustrates the heart of the FrontlineSMS approach - by the community, for the community. The HTTP trigger is getting a tweak too - it is now possible to set it to start automatically when you launch FrontlineSMS. And last but not least, we're very grateful to be including a new Ukrainian translation from Katerina Ivchenko and Aleksei Ivanov. Software update: v1.6.14 including Translation Manager! Following another new release (now available for download from the website), a word from our lovely developer team. Alex is currently sunning himself in the south of France, so we'll hear from Morgan - who as fate would have it is currently hard at work in his alternative office... in the south of France. 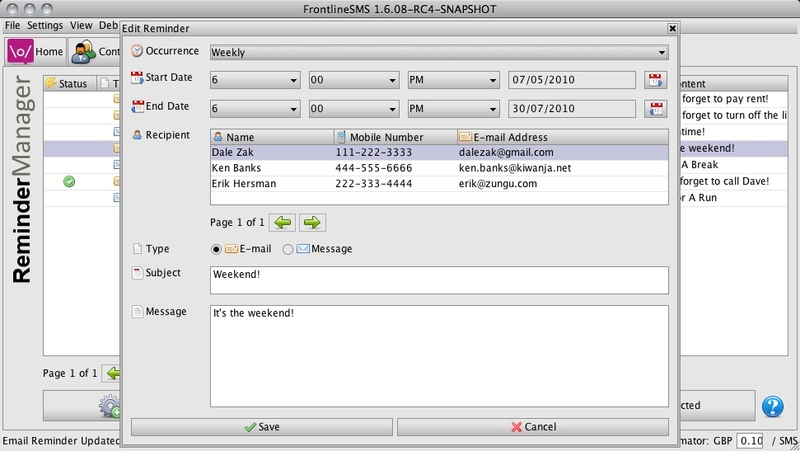 Ladies and gentlemen, please welcome the latest release of FrontlineSMS: v1.6.14. As you might have noticed, new builds have been fairly frequent since we released FrontlineSMS v1.6! Now that we've changed the architecture of our code, and we have two full-time developers, we're trying to make things move faster. Our new work process is simple: we build a release candidate. Then, this version is tested by our wonderful testers (including Aleksei Ivanov in Russia, and Aptivate in Cambridge), and once we're happy with it, we release it to the public. Then, we spend our time implementing new features, and fixing any issues you share with us on the community page. When a new iteration is finished, we build a release candidate, and then start all over again. Now you are familiar with our process, let's talk a bit about FrontlineSMS 1.6.14 and its new features. First of all, we've fixed some important issues. You can now label fields in the Forms plugin, and send SMS using IntelliSMS once more. We also added a fix to several smaller issues. But the main change in FrontlineSMS 1.6.14 is the new Translation Manager. This new plugin now allows you to help us translate FrontlineSMS into different languages. As you know, FrontlineSMS is available in an increasing number of languages, and each has been put together by teams of volunteers. Up until now, incorporating a new language has been difficult, and has relied on support from the core FrontlineSMS team. Translation Manager changes all that, and allows you to create your own translations without needing to work through us. You can edit existing translations in case you find errors, or want anything changed. You can also create brand new translations, and then send us the files so we can include them in future public releases. Please note, however, that this plugin is still in Beta, and it would be amazing if you could help us improve it! Announcing a new version of FrontlineSMS: 1.6! For a guide to installing the new version of FrontlineSMS if you're already using an older version, click here. HTTP Trigger People have been asking for this for a long time, and now it's here. FrontlineSMS can now accept incoming HTTP requests to trigger message sending. This means that FrontlineSMS can easily be used as an SMS sending service for other applications, or even web services. Plugin framework We've worked closely with the FrontlineSMS:Medic team, and Ushahidi, on a way to make FrontlineSMS more adaptable to specific needs. FrontlineSMS now has a framework for writing your own plugins so that you can implement new workflows and custom data handling more easily. This will help us understand who is using the software, and how, and also to show our very kind donors some key statistics about our user base. These figures will also lead to a very pretty blog post at some stage in the future. What's more, the statistics can be texted to us, which we thought was rather cool. Many thanks to all of you for your contributions! Along with the new features, we've also done a lot of work on the FrontlineSMS codebase to improve code quality, reliability and maintainability. These include modularising the UI, changing from our homegrown JDBC-based database engine to Hibernate, and adding extensive unit tests to the project. We've also restructured the Forms tab as a plugin implemented in the standard way. Soon we'll be starting work on the next phase of FrontlineSMS development. Along with improvements to the plugin framework, general maintenance and working on support for new phones, we'll also be embarking on a major new feature: MMS! Currently FrontlineSMS allows you to send and receive text messages, but we're aiming to add support for picture messages soon. 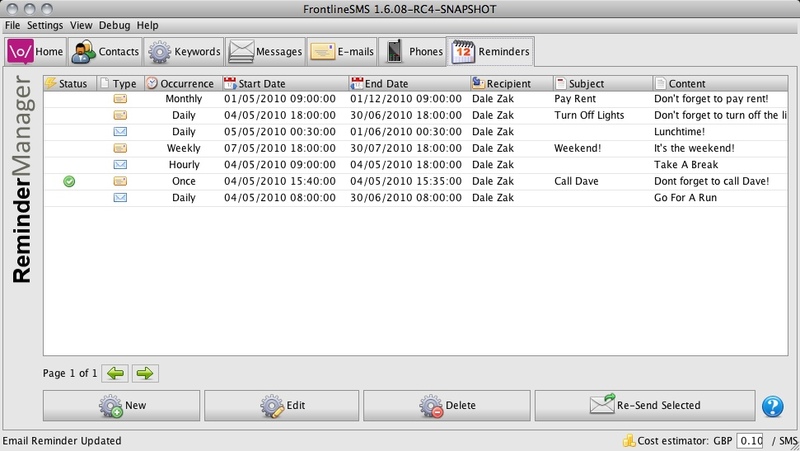 Dale Zak has already developed the first contributed plugin for FrontlineSMS - "Reminders". It allows you to schedule SMS and email to be sent by FrontlineSMS at set intervals, e.g. every day or every week. Currently in beta, we look forward to including the Reminders plugin in a future release.